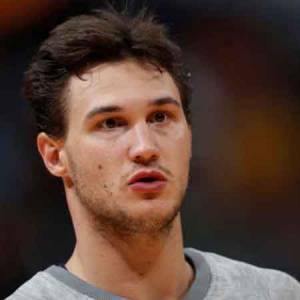 Danilo Gallinari is an Italian professional Basketball player who plays in the National Basketball Association (NBA). As of 2019, Danilo Gallinari currently plays for the Los Angeles Clippers as their small forward. Danilo Gallinari has played for other teams like Assigeco Casalpusterlengo (2004-2005), Nuova Pallacanestro Pavia (2005-2006), Olimpia Milano (2006-2008), New York Knicks (2008-2011), Denver Nuggets (2011-2017), and Olimpia Milano (2011). As a small forward, Danilo Gallinari reportedly earns multiple figures as his yearly salary from $21,587,579 as well as has a jaw-dropping net worth of $50 million in 2019. As per his personal life, he is possibly single and unmarried. Danilo Gallinari has an estimated net worth of over $50 million, in 2019. He previously signed a 3-year contract worth $64,762,737 with Denver Nuggets and now reportedly signed to Los Angeles Clippers. Further, the NBA player has an average salary of $21,587,579 annually. Grinta, classe, potenza. #KiaStinger fa la differenza. Danilo Gallinari so far has made earnings of $114,277,659 from his entire NBA career. He is the highest paid player of the Los Angeles Clippers this year more than other key players in the team like Tobias Harris, Marcin Gortat, Avery Bradley, Boban Marjanovic, and many others. Kept aside Danilo Gallinari financial earnings, his personal assets include a Home and various supercars like Ferrari, Jaguar and many more. Further, the NBA Player also earn from various sponsors. Who is Danilo Gallinari dating currently? Danilo Gallinari's father Vittorio Gallinari was also a professional basket player. During his active years, he played with several teams including the Olimpia Milano and Scaligera Basket Verona among many others. Danilo hasn't married yet but was rumored to have an affair with Brittny Gastineau, a reality television star. It is not known whether the rumor is true. Once when asked he mentioned the name of Madalina Ghenea to be the most beautiful he ever met. She is a Romanian actress but resides in Italy. Other than being a famous NBA Basketball player, Danilo Gallinari is pretty famous in social media. He has a huge fan following of 308K on Instagram and 718K on his official Twitter account. Danilo Gallinari is not only a world-class athlete but also has a very attractive individual. The Famous NBA star is 6 feet 10 inch / 2.08 m in height and weighs around 225 lbs / 102 kg. Danilo Gallinari was born on August 8, 1988, in Sant Angelo Lodigiano, Italy to father Vittorio Gallinari and mother Marilisa Gallinari. As per his nationality, he is Italian. Further, his star sign is Leo. He grew up along with his siblings, Federico Gallinari. After completing his high school Danilo Gallinari attended the Catholic University of the Sacred Heart where played Basketball for his college team. Danilo Gallinari started his career playing for an Italian professional club, Assigeco Casalpusterlengo in 2004. Pallacanestro Olimpia Milano acquired Danila in 2005 then sent to Edimes Pavia. During the 2005-2006 season, he was a candidate for best Italian player of the Italian league second division championship. Later the club, Olimpia Milano recalled Danilo where he played till 2008 season of the first tier level continental club competition of Europe and subsequently named the EuroLeague 2007-08season's Rising Star award winner. With the 6th overall pick of 2008 NBA draft, Danilo was selected by New York Knicks for two years. On February 22, 2011, he was traded to Denver Nuggets signing a multi-year additional contract. Danilo is currently Playing for the Los Angeles Clippers after signing a contract in on July 6, 2017. He wore a jersey no. 8.